Studies Show Life Expectancy Down in U.S. 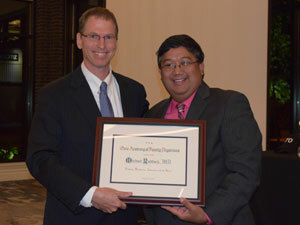 The Ohio Academy of Family Physicians (OAFP) honored Michael Raddock, MD, as the Family Medicine Educator of the Year, on August 18 during the 2018 Family Medicine Celebration Academy Awards Dinner at The Grand Event Center in Columbus, OH. Dr. Raddock has been a family physician and educator for the MetroHealth Family Medicine Residency program in Cleveland, OH, for the past 19 years. In his role, he precepts family medicine residents and medical students, and provides medical care to vulnerable populations, including a large Hispanic and Latino population. Dr. Raddock has a passion for education, and leads the longitudinal didactics and curriculum at the MetroHealth Medical Center. He engages residents in trying new methods and delivery of educational content, which includes evidence-based methods and information. In medical school, Dr. Raddock enjoyed every clinical rotation he completed. During his time at the University of California, Los Angeles, he worked at a clinic in a Salvation Army homeless shelter under the supervision of a family physician. Upon completing medical school and residency, Dr. Raddock worked as a staff physician in Seattle, WA, while his wife completed her training. Soon after, they moved to Cleveland, where he joined the MetroHealth Family Medicine Department in 1999. Dr. Raddock has received many awards for his teachings including the Distinguished Faculty Award, Award for Effort toward the Advancement of Women in Medicine, and the 2016 Scholarship in Teaching Award, from the Case Western Reserve University School of Medicine. “He’s the person who can look at a very complicated situation and help you break it down into individual parts and does it in a way that allows you to make the right choice, but with lots of guidance and insight,” said Christine Alexander, MD, department chair at MetroHealth. Dr. Raddock received his bachelor of arts in microbiology and doctor of medicine from the University of California, Santa Barbara and completed his residency training at the Providence Medical Center in Seattle. He also completed fellowships in Leadership in Primary Care, Research Training, and Behavioral Science Training. Dr. Raddock and his wife, Christina, reside in Shaker Heights, OH, and have three children – Will, Rachel, and Lilah. The OAFP annually presents the Family Medicine Educator of the Year Award to a family medicine educator that meets and exceeds the criteria of being a capable teacher of family medicine, successful administrator/practitioner, productive researcher/scholar, and inspiring leader. address book or list of approved senders. The information and opinions published in the Weekly Family Medicine Update represent the views of the authors, not those of the publication or the OAFP unless otherwise stated. The acceptance of advertising does not reflect endorsement of products or services by this publication or the OAFP.